With 10 days left of the voyage we are now heading north, starting to make our way back to Wellington. 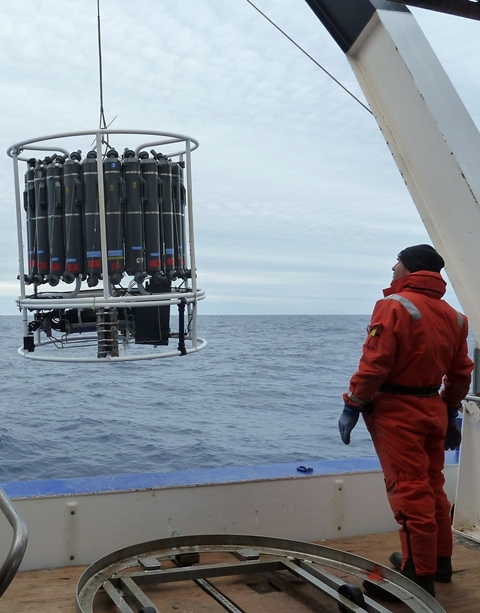 As with our trip south, we are undertaking some sampling with the CTD (see previous blog posts) along the way. The CTD is the primary research tool for oceanographers. At the heart of it are the probes which measure pressure, temperature, conductivity, and dissolved oxygen. From temperature and conductivity, we calculate salinity (i.e. how salty the ocean is). Around the CTD sits the ‘Rosette’, with up to 24×10 litre water sampling bottles. On this trip, however, we have removed 2 of these bottles so that we can mount a lowered Acoustic Doppler Current Profiler (LADCP) and Tiny oceanographic gyroscope system (TOGS). The LADCP sends out a high frequency sound which bounces off particles in the ocean and is reflected back. It uses the return signal to determine the speed of the water going past, and so it gives us measurements of the ocean currents. TOGS is a gyrocompass that tells us direction, without requiring a magnetic field to determine compass direction. This is particularly important this close to the south magnetic pole (see blog post 16: The South Pole). Unfortunately, this particular instrument is only rated to 3000m water depth, so it cannot be used on the really deep stations (3000 to 4500m). The 10 litre sample bottles are open at both ends and can be triggered remotely to close at different depths. Once released the ends close, trapping the water inside the bottle so it can be brought to surface for sampling. As the ship nears each CTD station we turn all the instruments on and reset all the bottles on the CTD, and it is moved into the cutaway – an area of the ship which has a low side for launching and retrieving equipment. After it is launched by the crew, it will take about three hours to go down to the seafloor and back again for a station of 3000 m water depth, as it takes roughly one hour for each 1000 m of water. While the CTD is in the water several of the scientists will watch the numbers coming back from the CTD sensors, mainly to check it’s working but also to communicate with the crew, who drive the winch, about where we need to stop. The first stop is at about 15m to wait for the pumps on the CTD to turn on. The pumps make sure we have an even flow of water over the sensors. Once the pumps are on, it’s back to surface, then straight down to the bottom. To make sure we don’t actually hit the seafloor with the CTD, it has an altimeter. This tells us how far we are off the bottom once we are less than 50m from the seafloor. We aim to sit the CTD between 5 and 10m off the bottom. If we hit the bottom we could stir up mud that might block the sensors, or if the bottom is rocky and we crash into it, we might damage the expensive instruments. On the way back up to the surface we trigger the bottles on the rosette, allowing them to spring closed. We sample at the most interesting parts of the temperature, salinity and dissolved oxygen profiles that we have measured on the way down. 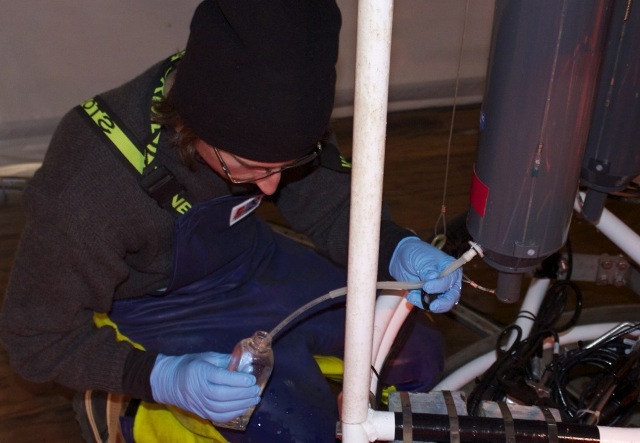 The water samples are important because they give us the water we can analyse either in the laboratories on the ship, or back on shore. Although we measure dissolved oxygen and salinity electronically, the sensors are often not accurate enough. So some of the water is used to measure salinity and dissolved oxygen to check the sensors. The rest of the water is used to undertake measurements that we don’t have sensors. The weight of the water at 3000m is 3000 times the weight of the water at 1m depth and the pressure is 300 times greater. So if we sampled surface water on the way down and took it down to the bottom of the ocean the extreme pressure would crush the full sample bottle. Empty ones don’t get crushed as the pressure inside the open bottle is the same as on the outside. The bottles are made strong enough to cope with 10 litres of water under pressure coming up, but can’t go the other way. Once all the bottles have been fired, we bring the CTD out of the water and collect samples from each of the 10 litre bottles for all the different analyses. There is a strict order in which water samples are taken. Dissolved gases are taken first as they can escape into the atmosphere once the bottles are opened. So we have been taking dissolved oxygen, total carbon, alkalinity, salinity, nutrients (phosphate, nitrate and silicate) and then carbon and oxygen isotopes. It takes about an hour to sample for all these different analyses from the bottles on the rosette, and download the data from the LADCP, TOGS and camera. While we are doing this the ship moves on to the next station. Often there is just enough time to sample before we are on the next station, then we start all over again…unless the geologists are deploying a core, in which case we might have time for a cup of tea.